If you have ever considered attending a Juggling Convention, but have no idea what to expect, I hope that this article can get you excited enough to book a ticket and enjoy this new experience! Every convention is unique. Even the same convention in consecutive years may be different (including being in a different venue), but usually they have several things in common. This article describes what the author has experienced at various Conventions throughout Europe. 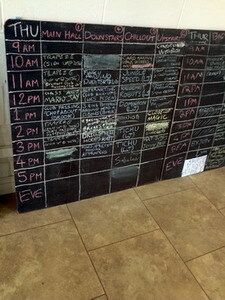 I have reviewed most Juggling Conventions I have attended, and you can find the information here – Juggling Conventions. Plenty of photographs, video clips and reviews. These are far more in-depth than this article, which simply provides a good starting point. Basically, a Juggling Convention is somewhere that a load of jugglers and prop manipulators (devilstick, diabolo and any other prop you can think of) can meet up and enjoy each other’s company. Lots of chances to practice your skills, but very much a case of choosing your own adventure, as you may have just as much fun being inspired watching other people practice, and chatting to friends than actively learning something! This is the main meeting area for all jugglers. This will hopefully be open 24hrs a day, which allows everyone the chance to practice and be inspired at all times of the day. If you have travelled from overseas, you may not need to adjust your body clock to the new timezone in order to practice at your regular time! It’s not the best place to try and arrange to meet someone, as you will be in a room with hundreds of other jugglers! Make sure you bring your tent if the event requires camping, as you are not allowed to simply find a corner of the main juggling hall to sleep in (I think it would be quite scary to try and get to sleep while props were flying all around you anyway)! These are run voluntarily, although sometimes it is written into the public show main acts contracts that they have to provide a few workshops teaching their craft as part of the deal. Most of the entertainers would have happily volunteered to do this anyway! These workshops will be free to attend and take part in, and you can find out what is happening and where it is happening by consulting the huge notice boards usually near the reception/information desk. They are in a grid style with the time (usually in hourly blocks) down the left, and the room name along the top. This creates a wonderful grid which can be filled in by anyone coming along and writing in a space. Between 10am-6pm on most days of a large juggling convention, you could certainly just fill your time attending classes and learning from lots of experts in all sorts of prop manipulation! People are encouraged to run a workshop, and if you have a particular request for a certain workshop, it is worth contacting the workshop organiser in advance of the event as they may be able to encourage the right person to run such a workshop especially for you! 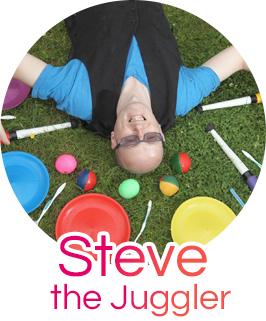 If you belong to a Juggling Club, then it is a good idea to arrange to camp together and form your own tribe. It helps you to look out for each other during the convention, and allows a good gathering place to chill out and eat between your planned activities. Sometimes there might be a quiet camping area, and a more noisy area. Don’t expect the quiet area to be quiet, but it should hopefully be a lot less noisy than the other one! Carry this with you at all times! If you lose it, you will have to buy another one! Hopefully the convention organisers will have made the pass something useful like a bottle opener, or a wristband so that you are easily able to carry it around with you. This usually happens each night, usually after 10.30pm (except the first and last night’s of a convention) and gives anyone a chance to get up and do something. The quality completely varies from night to night, and it lasts as long as people are willing to come up on stage and do something. There will be one or two hosts trying to control what is happening. The show might start off fairly clean, but can quickly descend into much more filth depending on how drunk/fearless the participants get. Several times I have left a renegade before the very end only to discover that a major juggling star got up and did an amazing routine after I had gone! Sometimes the acts in a renegade are the stars from the Public Show, and sometimes their act is even better at a renegade as the pressure is off, and they can enjoy the show and attempt more difficult routines. Doesn’t matter if they make a mistake, as it’s just a renegade where anyone is welcome to try anything! At the last BJC I attended, the biggest applause for a Renegade Act went to the Security Guard (guarding the campsite) who had learned to juggle throughout the week and did a simple cascade pattern! Many acts who started out giving it a try during a renegade have went on to become stars of the Public Show. We all have to start somewhere and Renegade is one of those open invite opportunities not to be missed! Sometimes other conventions become a part of the main convention. This has happened at the British Juggling Convention where they have hosted the National Kendama Championships, as well as the Balloon Modelling Convention. At the Scottish Juggling Convention, we also had the National Face Painters. This certainly helped even up the male-female ratio for the Ceilidh, and also provided the acts for the Public Show with stunning face paint and make up! As the name suggests, this is a show that is open to the Public. The Jugglers will usually have paid for this as part of their convention ticket price, but this means that they will have to look after their ticket for the whole week until it is time for the show, so keep it safe! It is usually held in a large theatre with free buses laid on from the Convention site direct to the venue, arriving a few hours before the show, so that we can discover a different part of the world and get some dinner before it begins! The show will be full of acts picked to impress the main public (who will most likely never have attended this kind of show before) as well as some of the top jugglers in the Country/World to really impress the Juggling community. Juggling Games: Your chance to take part in a variety of juggling related games using a variety of different props. Just as fun to watch as to take part in! Look out for (and stand well back from) the Unicycle Gladiators competition, and marvel at the skills of the 7 ball endurance among the many games that might be played! This doesn’t always happen, but sometimes if the Convention is holding the Public Games in the Town Centre, then a parade might be organised between the two spaces. It lets the local Community see lots of wonderful and unique jugglers and gives you a chance to show off some skills! There will hopefully be an area set aside for people to relax, enjoy some food and chat with each other without the chance of being hit on the head by a flying prop. Sometimes jugglers will have brought a load of board games, and this is your chance to enjoy the joys of reversi-robot or Elk-fest and many other interesting and very unique games! Hopefully you will remember to do some juggling at some point and not just stay in this zone all day! European Juggling Convention is held in a different European Country each year. It began in 1978 in Brighton. Usually lasts between 7-10 days. British Juggling Convention is held somewhere in the UK, usually around Easter-time (although there have been exceptions to this rule) and usually attracts around 750-1000 people. JuggLINCOLNvention (held in Lincoln) – great name! These will usually happen in exactly the same location every year, and will have built up a nice little community of jugglers who look forward to meeting up annually. Each of these conventions will be completely unique, and it is worth trying to attend lots of different ones whenever your work schedule allows, until you find the one or two that you really like and can attend regularly! Certain Events might happen to take advantage of the Conventions Location. This might include a Public Games show held in the town centre instead of on site, or an attempt for the world Haggis Juggling record at the Scottish Juggling Convention! If you enjoyed this article, please pass it on to other people who might be interested in attending a Convention. You might also like to read my “What Happens at a Juggling Club?” article.